Recommendations for additional links to this web page are very welcome but please note they should be specifically related to the content of this website, namely Combined Operations in World War II. Veterans UK - Support for Veterans. Veterans UK - Service Records. Information, advice and guidance on obtaining copies of service records. Links to the home page of this comprehensive Canadian Government site. Includes a great amount of historical information from official sources and personal reminiscences, research facilities, a youth section, special features and much more besides. It includes 3.6 million records from Australia, New Zealand, Ireland, Britain and the United States. Their mission is to deliver an enduring national network of support for our wounded and their families. We will inspire and enable those who have made sacrifices on our behalf to achieve their full potential. The war in Afghanistan may be nearly over, but for those who have suffered life-changing injuries, their battles are just beginning. We will not let them fight these battles alone. This is a vast site covering many aspects of life in the UK. Amongst the records held, but not available on-line, are some on Combined Operations. These can be accessed by personal callers or remotely via a list of independent researchers (search fee to be negotiated with the researcher of your choice). The largest UK database of Armed Forces and Ex-Forces Personnel on the web. You are more likely to find your old UK forces friends here (and they are more likely to find you) than anywhere else on the web, fact! Forces Reunited® lets you find old friends and colleagues plus read what they are doing now. It's free to register, search and browse entries for the members listed. Selected Navy records on line free. The Internet Archive, a 501(c)(3) non-profit, is building a digital library of Internet sites and other cultural artefacts in digital form. Like a paper library, it provides free access to researchers, historians, scholars, and the general public. A forum for old shipmates of HMS Intrepid to pull up a bollard and swing a lantern. Also the home of the HMS Intrepid Association. General or tailored guided visits to the Normandy beaches and their hinterland by an experienced guide and artist. This is a social network website for the ex and serving men and women in the Armed Forces. The site is also open for anyone with an interest in the military, and is completely free. It is extremely easy to use, after a few mouse clicks you’re able to reunite with old friends from the military days, or connect with serving colleagues. You can share photos, blogs, videos and interests within your growing network of friends. Archived by British Library, US Library of Congress, Bavarian State Library. WW1, inter-war, WW2 and post WW2. Naval-History.Net started with two books written by Gordon Smith on the War at Sea in World War 2 and Battles of the Falklands. It has since expanded, not only with his own World War 1 and 2 researches, but such work as RN casualty lists 1914 to the present and daily RN ship movements 1939 to March 1942 by American researcher Don Kindell and 1,000 WW2 ship histories by Lt Cdr Geoff Mason Rtd. Naval-History.Net is listed in the top 10 websites in a "A Guide to Military History on the Internet" by Simon Fowler of the National Archives. US Online Military Indexes and Records. This website is a directory of links to online military indexes and records for USA genealogy research. Included are rosters, databases of soldiers, draft card databases for World War I and II, and listings of military and war casualties. US Department of Veteran Affairs Crisis Hotline Connect with the Veterans Crisis Line to reach caring, qualified responders with the Department of Veterans Affairs. Many of them are Veterans themselves. Planning for Life after Discharge How to Plan for Life After Discharge: A Guide for Veterans. Transition to Civilian Life According to the Pew Research Center, 44 percent of the veterans who served after September 11, 2001, have found that the transition back to civilian life was very difficult. Emotional trauma suffered on the battlefield combined with the civilian skills that some veterans have lost over their time in service combine to create this challenge. For some, physical disabilities add to the challenges they will face. Surviving Spouses Resources Learn how we, as military families ourselves, interact with our own community to understand what issues are the most significant. Find out what you can do to make sure that the well-being of military wives, husbands, children, parents, and siblings is at the forefront of policymakers’ minds. Best Jobs for Returning Service Personnel When returning from active duty and transitioning to civilian life, one of the first things a soldier must do is find a job. While military service provides many critical skills that can translate well into civilian jobs, sometimes the transition itself and communicating those skills to a non-military hiring manager is a big challenge to overcome. It's probably easier to list what's not on this site! Includes Duxford Air museum, Cabinet War Rooms, HMS Belfast, 1940s House and thousands of other references. Well worth many visits! The Arboretum is set in the pleasant countryside of Staffordshire, between the towns of Lichfield and Burton-upon-Trent. It provides a living and lasting focus for remembrance essentially for those who have lost their lives or suffered in the service of their country. It is a haven of peace and contemplation and is the location of the Memorial to Combined Operations. Dirigible Balloon Hanger and Museum, Ecausseville France. Map, photos, information and links to this unique example of a 100 year old hanger nearly 500 ft long, 100 ft high and 125 ft wide, constructed to protect airships whose purpose was to disable or sink German U Boats in WW1. Also used in WW2 and during the so called Cold War. The Gazelle Squadron Display Team. The Gazelle Squadron is a unique team of ex-British Military Gazelle helicopters in their original military colours and with their original military registrations. The core team includes four Gazelles, one from each service; The Royal Navy, The Royal Marines, The Army Air Corps and The Royal Air Force. A fifth Gazelle in Royal Marines colours will provide intimate support for the Team. 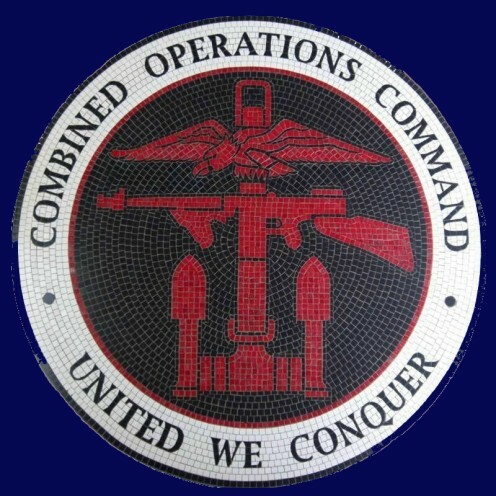 Their crest, includes the Combined Operations badge. The last, and possibly, only time the badge was seen on an aircraft was in the early mid 40s. A photo of the Hurricane concerned is included in the 516 Squadron webpage. US Assault Training Center SW England Friends. A not-for-profit organisation dedicated to preserve and promote the U.S. Assault Training Center of World War II in practical and historical matters through education.